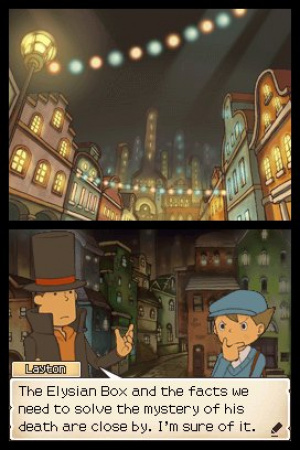 Is Professor Layton's second adventure the worthy sequel fans are hoping for? After the success of the first Professor Layton release on the DS, it should come as no surprise that we'd get a sequel. The game's unique blend of mystery storytelling and brain-teasing puzzles somehow forms one of the most unique and engrossing gaming experiences available for the system and a game that's already captured the hearts of gamers the world over. But is this sequel everything fans of the first title were hoping for and does it carry on the endearing charm found in its predecessor? 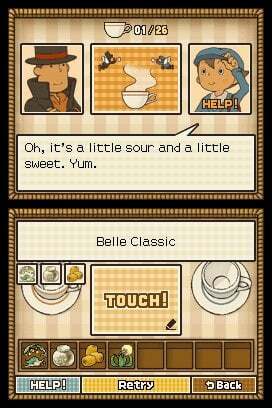 For those unfamiliar with the Professor Layton titles, the game basically builds an adventure around a classic mystery and allows you to progress through it by solving many brain-teasing puzzles. Each time you solve a puzzle you'll acquire something you need in the game, whether it be an actual item or possibly a valuable piece of information you'll need to solve a mystery. As you enter each area of the game, you'll soon learn to use your stylus to touch various objects around the screen to interact with them. You can move around in the various areas using the shoe icon that will present you with yellow arrows that display the various direction(s) you can currently move in. The top screen of the DS will generally keep a running map of the areas along with a hint to where you need to go next. While the game is fairly linear in design, it does offer you a bit of freedom as to where you go and which puzzles you encounter. If you somehow miss a puzzle along the way, it's placed in a hut that you can gain access to later in the game. You can then go back and complete any unsolved puzzles in your own time. You'll also see the Professor's Trunk icon in the upper-left corner of the screen that will bring up a host of options to choose from. The Journal icon will give you a rundown of everything you've experienced in the game from Professor Layton's viewpoint. This can be a good feature in case you need to go back and review the game's past occurrences. The Mysteries icon shows you all of the current mysteries you're involved in and tells you whether or not they've been solved. This a good place to look when you're feeling lost and unsure of what to do next. Of course, there's also the Puzzle Index that lists all of the various puzzles you've already solved in the game. You can even go back and play any of the unlocked puzzles at any time throughout the game if you're so inclined. Aside from the main game, there are also two mini-games featured in this adventure. The Camera mini-game allows you to piece together a broken camera from parts you find throughout the main adventure, and the Hamster mini-game allows you to get an overweight hamster back into shape using various items you'll find while solving the game's many puzzles. These mini-games might seem like a tacked on attempt to stir up some replay value, but they're actually quite fun if you take the time to complete them. While the mystery is the meat of the game's entertainment value, it's the brain teasers the game challenges you with that give its unique charm. These puzzles are extremely varied in design and include mathematical word problems, sliding puzzles, mazes and many other tricky challenges for you to solve. Some of these puzzles are fairly simple in design whereas others can be quite tricky and will force you to put on your thinking cap if you're to have any hope of solving them. You're also rewarded based on how many attempts it takes you to solve the puzzles. The fewer the attempts, the more Picarats you'll earn. It's a good incentive to get you to stop and really think about the puzzles before quickly jotting down an answer. The story line plays a big role in the progression of the game and will provide you with all of the clues needed to solve the various mysteries. Although the game revolves around one main mystery, there are smaller mysteries that will pop up along the way that you'll have to solve in order to move on in your quest. It's all very well-designed and written, keeping the storyline engaging during your trek through the game. Even the control itself is extremely intuitive and makes playing the game easy for gamers of any age. It also allows you to focus your attention on the game at hand instead of fumbling through a host of overly complicated play control maneuvers. 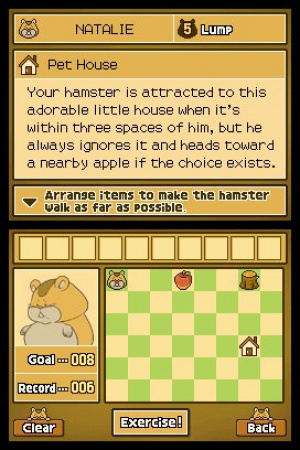 It's clear that the developers knew they were onto something with the original Professor Layton release and didn't try to reinvent the wheel when it came time to put this sequel together. 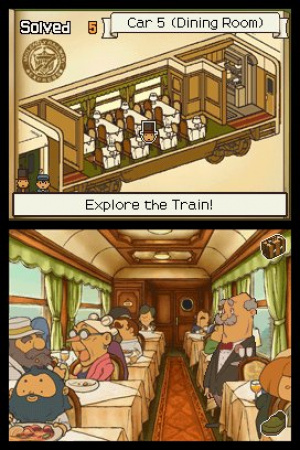 There's no denying that the storybook visuals found in Professor Layton and Pandora's Box are impressive. The classic European look of the game makes it the perfect environment for its type of mystery story and each new area is as visually appealing as the one before it. Even the cutscenes that appear at random intervals are very smooth and well animated. It's clear that the developers put some time into making the game look as good as it plays and this extra effort really pays off in the finished product. The musical presentation is quite similar to the visuals in the way it perfectly melds with the other aspects of the game and seems to fit its tone like a glove. There are quite a few amazing musical tracks to enjoy and the voiced dialog just adds to what is an already impressive audio experience. With a game that features a classic European theme like Professor Layton, you'd assume that there would be a risk of overdoing the voice acting, but the developers have somehow managed to keep with the theme of the game without making it sound forced or overacted. While maybe not quite as impressive as that found in the first release, it's clear the developers were still able to capture the audio magic a second time around. 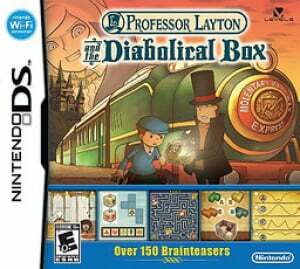 It should go without saying that fans of the first Professor Layton title will likely find a lot to like about this charming sequel. The game basically takes everything that was great about the first release and tweaks it all just enough to make it stand out as the worthy sequel it is. Not only are there tons of new puzzles for fans to sink their brains into, but the brand new storyline is as enthralling as ever and will keep you glued to your DS until the very end. If you enjoyed the original release, there's absolutely no reason for you not to own this gem of a title. And if for some reason you've yet to give the series a try, Pandora's Box provides you the perfect opportunity to find out what the fuss over Professor Layton is all about. Gah, there are too many DS games I have to buy. My copy should arrive from PlayAsia in a few days. Glad to see it's as good as the first one. Glad it was worth the wait. Hope it doesn't take as long to localize the 3rd (and upcoming 4th) game. Awesome game, already finished completely, doing every puzzle and bonus, awesome awesome game, cant wait for third. Excellent review for an excellent game! I didn't think that The Curious Village could be topped but I actually enjoyed this game more than the first one. Sigh, now comes the hard part of waiting patiently for the next game to arrive. Loved the first game. I'll definately be getting this, and every other in the series no doubt... but I'm going to wait for the price to go down a bit. Not enough gaming hours in it to justify the price for me at the moment. Playing through it at the moment... same blend of teeth-gnashing obviousness and mind-bending trickery. Hopefully can get it finished before the new Mario RPG comes out... who said the end of summer would be slow? Lol. it's all very well how you say you've finished it already and can't wait for the third game, but spare a thought for us Europeans! We don't get it until the 25th September! I am not quite sure what you mean SoulSilver, hehehehe, anyway on another site I am not sure I can mention that here, there is a trailer for the movie, it looks very nice. Fantastic game, but you missed a few things in the review. For one, there are actually three minigames--you forgot the tea-brewing mini game. That one is pretty important because it allows you to partake in various sidequests that involve brewing teas to relieve certain character's problems. You also forgot about the one big new gameplay mechanic--the "memo" function you can access during a puzzle. Other than that it was a good review and I agree with the score. I can't wait for the euro release! Great review! Didn't mention the Tea game on purpose. I figured I'd already spilled enough giving the other two away since these come along inside the story. Great game, great review. I already have this and loved it. Perfect review and score. I was worried it'd get an 8, but you pleasantly surprised me with a 9! Besides the top-flight puzzles, this is a really gorgeous game to look at. It reminds me of the beautiful European villages that I was lucky to travel through a few years back. I love the "Curious Village". Now I got to beat it fast so I can run out and get this! It sounds fun! To be honest I thought the ending didn't make sense, and it was too short. Still love it though. Oh, and did anyone else notice that the people in the dining car are also the ones used in the pictures on the touch screen in puzzles?